If you often feel like this, you need a new way of working. There’s a good post from yesterday’s Harvard Business Review blog by Tony Schwartz, president and CEO of The Energy Project. Tony is in the business of teaching individuals and companies how to take care of themselves and their employees so they can achieve maximum effectiveness. Tony’s message is simple: People aren’t machines or computers, and if you treat them as if they are, you’ll drain them of the energy they need to work effectively. We can’t sustain a work environment in which we work continuously, at high speeds, for long periods of time, running multiple programs at the same time. 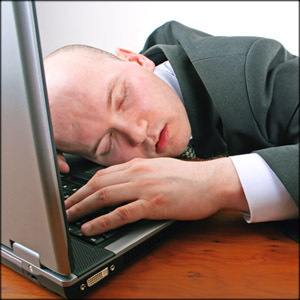 Even small amounts of sleep deprivation take a toll on people’s ability to concentrate. So, try to discourage early morning and late-night calls and meetings. People aren’t made to work for more than 90 minutes at high levels of focus, so make it a point to encourage break times throughout the day. Eat high-energy foods – lean proteins and complex carbohydrates – every three hours to keep a steady supply of glucose available. That means stocking your cafeteria with healthy foods. Working out is a powerful form of physical and mental renewal, so provide fitness facilities or outside gym memberships. Time with loved ones, and time for activities people enjoy, fuel positive emotions. Don’t email people on the weekend, and don’t expect them to be constantly plugged into their digital services. If you truly need to reach an employee, make a call. That way, people can be free from the ball and chain of email. Doing one thing at a time leads to better focus and higher quality work. Encourage employees to set aside times every day for uninterrupted focus — above all by doing the most important thing first every day for 60 to 90 minutes, and then taking a break. Tony is really onto something here. He offers a great prescription for making effective use of our time and abilities. This entry was posted in Health and Fitness and tagged diet, effectiveness, energy, focus. Bookmark the permalink. This is some really excellent advice. Thanks for sharing! WRITE ON!